← Is Trump beginning to trump the Deep State? Do we realize that all our war monuments are a form of mind control? I’ve long been acutely aware of how much we idolize war in this country. Not just our economy relies on war, so does our collective unconscious, to keep reminding us of the “sacrifice” of our young heroes to battle “in service of their country.” Plus, I’ve noticed that in all the war memorials that I run into everywhere I have lived, they’re always just dedicated to our dead. For example, the town I hail from originally, Twin Falls Idaho, constructed a Vietnam Memorial in the city park where we used to run and play. For example, Jackson Wyoming, in the very center of the town park (the one with the antlered arches), itself in the very center of the town, we find this. As I recall, it’s dedicated to the dead from World War II. I lived in Jackson for 18 years. Now I’ve lived in Bloomington Indiana for nearly 15 years. Here’s our tall, imposing war monument, in front of the court house, court house square, in the very center of the town. In all our monuments, the estimated 30 million who are not U.S. citizens that we have killed in our various excursions elsewhere are never mentioned, much less memorialized. Of course! For one thing, we have no idea who those foreigners were; even if we knew their names, we couldn’t pronounce them. They don’t speak English! And for another, we don’t really care. Not about them. Just about us. Or do we even care about us, since we keep funding war with our tax dollars? Since we keep on alluring impoverished young men — and now women! — to don uniforms with the promise of monetary perks afterwards? Since we keep on resourcing those 1000 bases elsewhere with “security,” with “goods and services,” with new infrastructure, not just airfields, but stores, dorms, recreational facilities, etc? Since college professors sell themselves to the devil by writing defence-related grants to keep their departments open? And that’s not even to mention the fact that creative human energy is continuously and massively misused by being misdirected into figuring out new, even more lethal weapons systems and their carriers — planes, drones, sea and space traveling vessels to destroy and to murder. On and on. The Deep State is indeed, deep. See this. So, I’m thrilled to see that peace activist David Swanson has just addressed this very topic. Oh, and BTW: Here are a few wonderful sculptures not memorializing war which grace the Indiana University campus. First the legendary Herman B. Wells, who brought Indiana University up to its present standards. You wouldn’t believe the number of people I’ve seen sitting next to Wells with their hand and arm seemingly frozen in the same position! Next, Adam and Eve. A wonderful statue with space between the man and the woman. Beautifully proportioned and anatomically correct, their yearning for each other is palpable. Adam was nearly ruined by a fierce storm that took out hundreds of trees in this woods and others a few years ago. Big local news. He’s back up now. And finally, my very favorite, Hoagie Carmichael at the piano. Every time puppy Shadow and I walk by this sculpture on campus we see some kind of flowering in his hand. 9 Responses to Do we realize that all our war monuments are a form of mind control? I haven’t seen the Adam & Eve sculpture in some time, and didn’t realize that its setting been so tastelessly sterilized –it originally sat under a pretty dense tree canopy at the edge of the “magic forest” (so called back in the ’70s because there was quite a lot of dope that was blown there). It is the work of Jean-Paul Darriau, head of the sculpture department here for many decades –a bit weird, but a very nice guy (long as you weren’t his student)– who died a few years ago. In a perhaps senseless act of “vandalism” (censorship?) about 20-30 years ago, Adam had his Member sawed off –the one you dote over now is a replacement which Darriau happily provided (at an outrageous price). But you’re right, the Hoagie sculpture does take the cake –and I enjoy showing it to my foreign students whenever I can; of course, they have no idea who Hoagland was, but also really like the idea of the perennial flowers which magically appear in his hand. has never really caught on. Well said Ann. If “the medium is the message” – then the medium of so many war monuments propagates the messages of endorsing, unquestioning, and repeating war after war. What if we thought about war differently? What if we monumented peace and peace treaties, and the methods of peace? Perhaps our “war dead” would be more at peace if that were the case. I no longer live in town, but assume that the annual, well-attended Memorial Day ceremonials are still going strong around the two War monuments on that square –while I doubt if 1% (0.1%?) of the county residents have ever even seen or heard of the Peace monument. I suppose the survivors of the Native American Holocaust could “monument” a bunch of the treaties which they signed –over two+ centuries– with the Great White Father in Washington. But who would go to see them (unless they happened to be situated next to Mount Rushmore)? Ahhh… I forgot to mention that, soon after our Peace monument was put up (c. 1980?) it was vandalized –the hand with the dove was broken off, and stolen. God, that’s an ugly piece of “sculpture” –do you suppose that the vandalism was rooted in some offended aesthetic sensibility? There is much to be said and done about peace – and it has to do with justice. Yeahbut, you’ve got to admit, Rusty, that that particular treaty didn’t last all that long –later in the 18th Dynasty there came a pharaoh who was determined to Make Egypt Great Again, and then the Hittites disappeared from the very pages of History. If we’re lucky, that godawful Peace statue on the Bloomington courthouse lawn will go the way of the Hittites, too. I pass by it twice a week, on my way down to our pathetic excuse for a “co-op” grocery store (with a decidedly Corporate mentalité among its management and Colossally Bored), and must think to take a closer look at the thing when I go next week –I’ve looked at it for decades since it went up (c. 1980? ), but never really saw what an aesthetic atrocity it actually is. No wonder Peace doesn’t have a Chance. Yes, the treaty didn’t last long, and the Bloomington statue is horrid. Not sure you caught the “peace treaty attempt” in Colombia last year – and how that’s still in tension now. I believe peacemaking is better than warmongering. Call me naive. I believe that it was Ram2 who tried to assuage the Hittite king by allowing one of the latter’s sons to marry one of his younger daughters –which, I think, actually happened. If *that* didn’t Seal the Deal, what good could a mere clay tablet with funny lines on it be? The Colombian thingie was obviously doomed from the get-go –our narco-trafficing CIA saw to that, since there’s no room for any amateurs to muscle in on that profit flow. 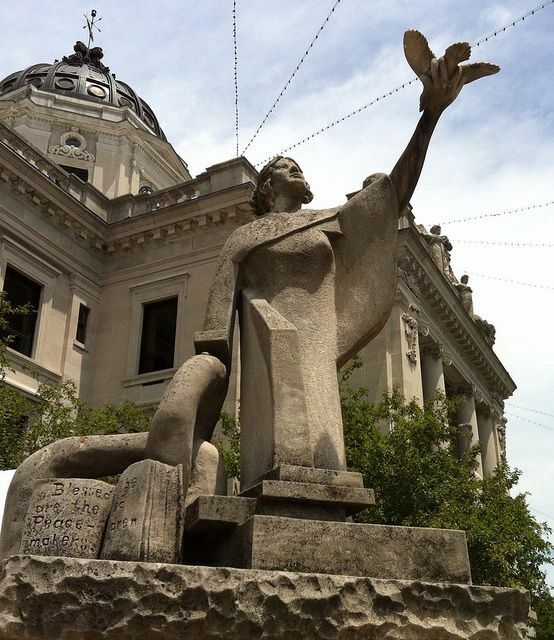 Is the “horrid” (nice word, btw) Bloomington Peace statue better than none at all? My jury is still out on that one; the vandalism to it soon after its erection certainly opened at least some eyes here in the Peoples Republic of Bloomington as to what was really going on in the community (as opposed to what a bunch of long-haired Leftie kids *thought* was going on). The Whar in Veet-nam –as LBJ liked to refer to it– was, at least in large part, “caused” by the U.S.’s refusal to accept the Free & Fair elections in the South clearly called for by the Treaty (“Final Declaration,” whatever) that came out of the ’54 Geneva Conference. Would it have made any difference at all if the U.S. had signed on to that agreement? In what way? Hey, I’m all for treaties –binding agreements between hostile parties which will last as long as the grass grows and the rivers run. That Geneva “Agreement” allowed the French to retire from their colony with “Honor” [sic]. How could that have been a bad thing? The Colombian example is an interesting one we get to watch in real time. Having been to Colombia about ten times, I have seen changes in the society over the last 20 years – each visit being a snapshot of a culture trying to get peace despite FARC, drugs, governmental corruption, etc.